Read the full story, which first appeared in Green Lodging News. The results of the New York City Mayor’s Zero Waste Challenge were recently revealed, with The Peninsula New York emerging tops in the hotel category. The Peninsula was able to double its diversion rate in just a few months during the Challenge, in the process, emerging as a role model just in time for New York City’s new commercial organics rule. Beginning July 19, 2016, certain New York City businesses are required by law to separate their organic waste for beneficial use (composting, anaerobic digestion or other). Among those affected are food service establishments in hotels with 150 or more rooms, like the Peninsula New York. “Food waste is a big contributor to overall waste,” said Maya Shenkman, Director of Hotel Services at Great Forest, Inc., which participated in the Mayor’s Zero Waste Challenge as a consultant, helping The Peninsula and other companies reach their goals. 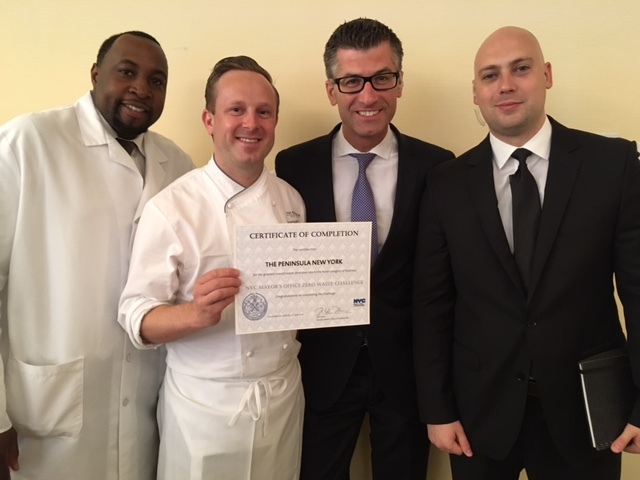 Lessons from The Peninsula New York’s win offer useful insights into how hotels and other businesses in the hospitality industry can deal with the food waste issue. For establishments in New York City, the following guide can be used as a simple roadmap for staying in compliance with the new rules. Read the guide to see how the Peninsula did it in Green Lodging News. This entry was posted in All, Awards, Great Forest Insights and tagged hotels, Zero Waste Challenge. Bookmark the permalink.